Home / Press Releases / ACTION UPDATE! 11 Human Rights activists arrested in E-1 Area! ACTION UPDATE! 11 Human Rights activists arrested in E-1 Area! **UPDATE** As of 6:00 pm all of those arrested have been released. 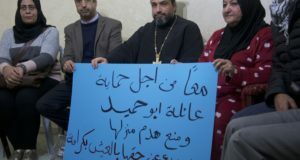 But the conditions of their release reveals the apartheid nature of the Israeli courts system. The Israelis and internationals arrested have only been made to sign conditions, the Palestinians alone are forced to go to court. 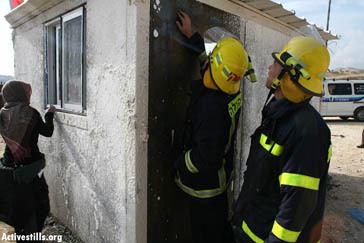 We will see what happens tomorrow when settlers try to establish themselves in the E-1 area, as well as in seven other areas across the West Bank. Will they be forced out as soon, and with as much force as these activists did today? 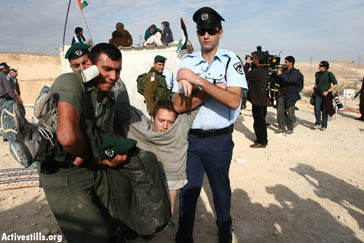 Three Palestinians, five Israelis, and three international (Swedish) activists were forcibly evicted from a Palestinian house and arrested today in the E-1 area. They have now been taken to Ma’ale Adumim police station. Early this morning Palestinians built a house in the controversial E-1 area. Palestinians are routinely denied permits to build on their own land, and homes that have been built are demolished. The Human Rights activists stayed inside for a few hours before a large police and army presence evicted them through use of force. The E-1, or East-1 area, is between Ma’ale Adumim and Jerusalem, on lands from nearby Palestinian villages. The Israeli government plans to build a settlement of 3,500 apartments and an industrial park in this area. This will effectively connect the Ma’ale Adumim settlement with Occupied East Jerusalem, dividing the West Bank in two while separating Jerusalem from all of it. 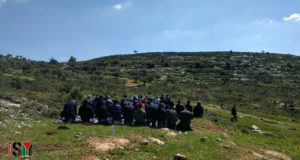 In addition land has recently been confiscated to build a road to connect the two Palestinian enclaves that will be created on both sides of the “settlement bloc”. On September 24th, the Israeli army confiscated 1,100 dunums of Palestinian land to provide ‘transportational contiguity’ by building a Palestinian-only road through the E1 area. The settlement blocs will be annexed to Israel with territorial contiguity, while Palestinians must settle for a collection of tunnels and bridges that will allow them to drive between the separate enclaves of the West Bank. These Apartheid roads will be controlled by Israel for security reasons, and will further divide the future ‘viable’ Palestinian state on more confiscated lands. This Palestinian family is not the only one to be forced to leave their homes. 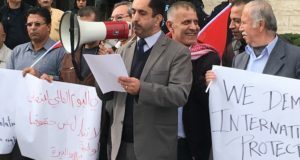 The 2,700 strong Jahalin Bedouin community is also being driven out of the land they have lived on as refugees since they were forced to leave the Negev desert after the Nakba. 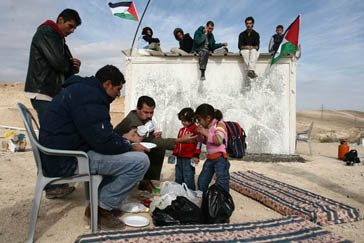 Israel plans to displace the Bedouin onto lands belonging to the adjacent Palestinian villages. In some cases in the past, the Bedouin were forcibly displaced onto private properties belonging to the residents of these communities.